A modern and innovative textured anti-ageing face oil. A small amount of this lightweight, fast-absorbing oil gives a boost of intensive moisture to comfort and soothes very dry skin. Light Reflecting Complex increases skin’s natural luminosity. Youthful radiance will be restored by morning. Foundation glides smoothly and lasts longer. Penetrates deeply, providing maximum hydration and firming benefits while anti-wrinkle ingredient helps to diminish fine lines and wrinkles. Infused with an ingredient which increases the skin’s own protective barrier, leading to a moisture increase of 6000% in 30 days for strengthening the skin. To be used at night either before moisturising for extra hydration or instead of moisturiser. Layer over Optimal Brightening Concentrate for optimal anti-aging and youthful radiance. Scented with delicate wild jasmine flower, known to be soothing and calming. Paraben-free, dermatologically tested, non-comedogenic, alcohol-free. Restorative Night Treatment is a 99% natural formula that contains a high concentration of pure essential fatty acid rich oils: Sweet Almond Oil, French Plum Oil and Rice Bran Oil. 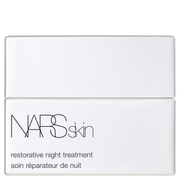 NARSskin restorative night treatment 30ml was found on 3 websites and was price compared using EAN: 0607845048121. The cheapest NARSskin restorative night treatment 30ml is shown as the main item, prices range from £62.00 to £63.00, excluding delivery. Price comparison based on price and delivery charges, with any valid discount codes being applied, is shown in the table above. Prices and information correct at the time of publication.